Miracles, big and small. Eight weeks ago, S was sent home on hospice with 2-8 weeks to live because of a pop-up freak leukemia and an eye infection that blurred his vision, closed his eye and extended into his brain. About four weeks ago God motivated us, and we are sure others, to pray specifically for S’s healing. During Slick’s drive from Seattle to Phoenix, S called to say he was planning to preach on Sunday. His eye infection is obviously on the mend and he’d been declared "in remission". They said he’d never see clearly again, but now not only is his eye open but he can see clearly out of it, too. I’d venture to say he can probably see many things more clearly now than ever! Clearly, God is healing him. Miraculously. Will you pray with us for S’s continued healing and remission, for the sake of God’s glory as well as that of his wife and 10 young kiddos? In answer to your prayers of last month, several events coincidentally* occurred on the same day that led us to discern God was directing us to a job with Lockheed Martin and the Japanese Air Force F-35’s at Misawa, Japan. So we are now in Phoenix for five months (back to Japan after that). Today, we continue to settle into our desert tan apartment and research activities for the girls even as we pray for the folks battling to get Misawa chapel programs moving forward. Would you intercede for a moment on their behalf, as well as on ours, that we might see where God would have us invest while we are here? 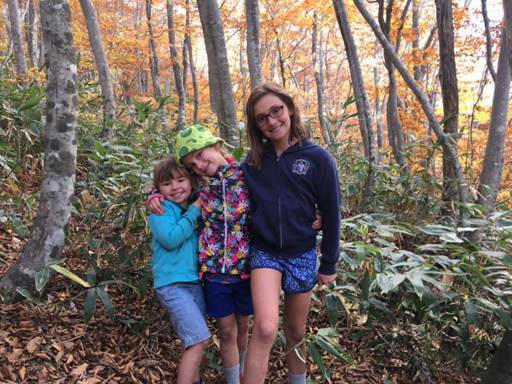 Gwendi, Matti and Zoe in the Hakkoda Mountains before we left Japan. 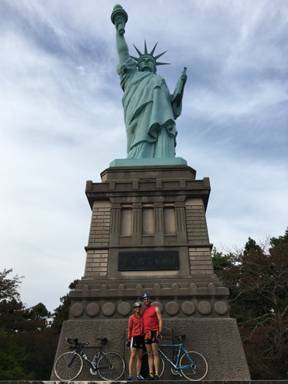 Statue of Liberty Park, a quick bike ride away from Misawa Air Base, Japan ? !